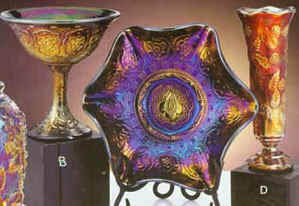 In 2004, Fenton introduced a limited range of items in Amethyst Carnival to celebrate their revival of this popular colour from their Contemporary Carnival made in the 1970s. 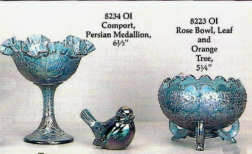 The catalogue page was provided to us by, and is shown here courtesy of the Fenton Family and Fenton Art Glass Company. ​There is an interesting reference in the text to "Six unique moulds (some from Fostoria and others from Imperial or Indiana)". 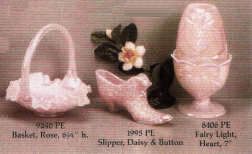 The Cornucopia Vase (#8395) came from Fostoria; the Pie Wagon (#4204) came from Imperial via Indiana; the Tulip Vase (#2856) came from McKee via Indiana. 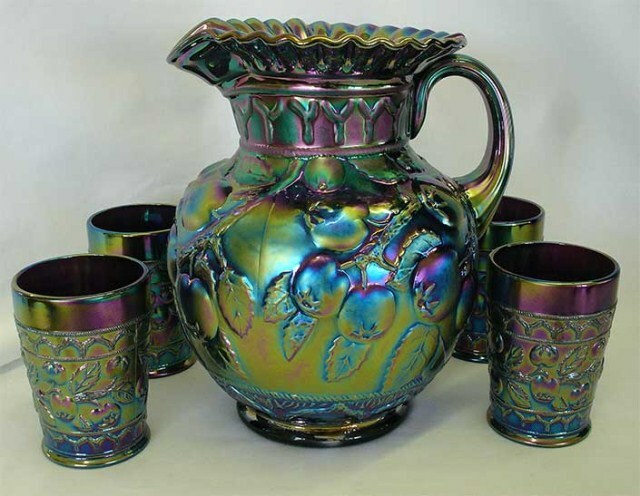 ​Apple Tree (#6555) - only made as a water set (pitcher and tumblers), this is a Classic (old) Carnival pattern that Fenton made over a lengthy period, from around 1912 though to 1929 (or possibly later). It was revived for Contemporary Carnival production, although it is not certain if the Contemporary pieces came from the original mould or whether a new mould was made. Below is the mould that was used to make the pitcher. It was blow moulded. Note that the top of the pitcher, as it came out of the mould, was vertical. The tight ruffling seen on the finished piece (shown right) was done by hand after the piece was taken from the mould. Note also that the handle was applied - it is not part of the mould. 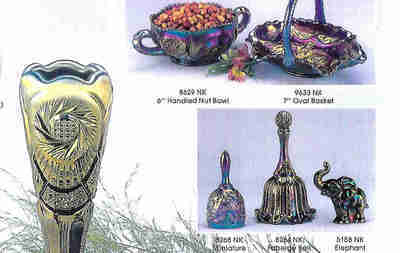 An amethyst Contemporary Apple Tree water set. Pie Wagon, Reber & Co. (#4204) - actually, it is a box, made in two pieces (the top of the wagon is the box lid). The mould was owned by Imperial, and the Pie Wagon is known marked ALIG and with an Imperial label. 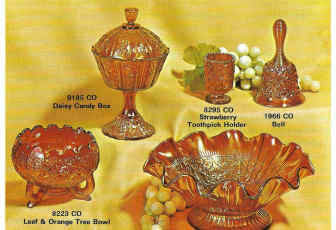 The mould subsequently moved to Indiana Glass as the Pie Wagon was made as a Tiara Exclusive. The mould was later acquired by Fenton as part of a large purchase of moulds from Indiana. Tulip Vase (#2856) - this vase pattern has a fascinating and much-travelled history which started in England and Czechoslovakia in the 1930s, journeyed through McKee and Indiana Glass and found its way to Fenton! The full Story Behind the Glass is told here in our (free): Network ezine #45. 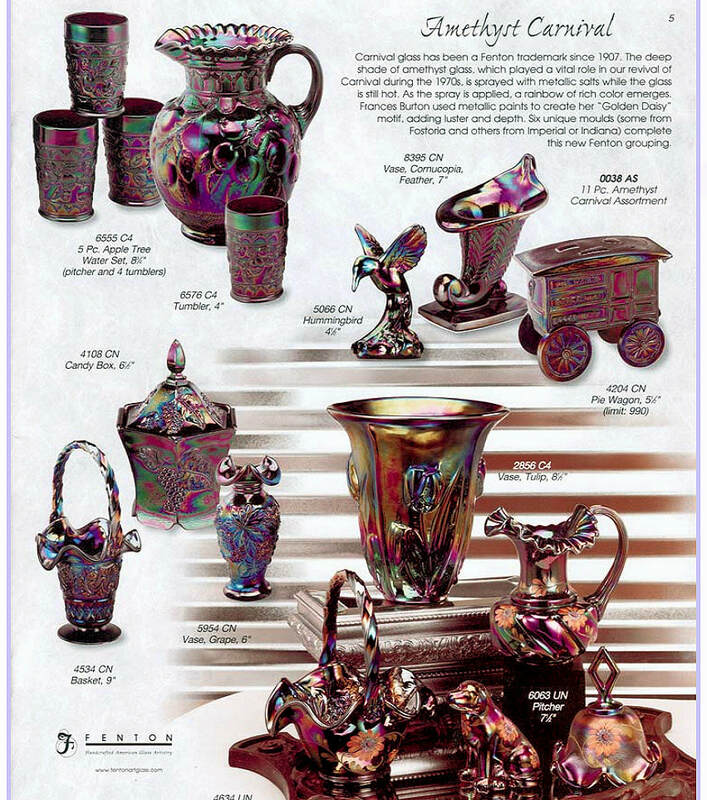 See more of Fenton's Contemporary Carnival Catalogues - click on an image below.